Ultra feminine and so elegant: This cotton blouse is certain to be a new favorite! Read on to see the step-by-step tutorial on how to sew this wrap blouse that debuted in our Blouses Galore! pattern collection from the March 2019 issue of BurdaStyle magazine. 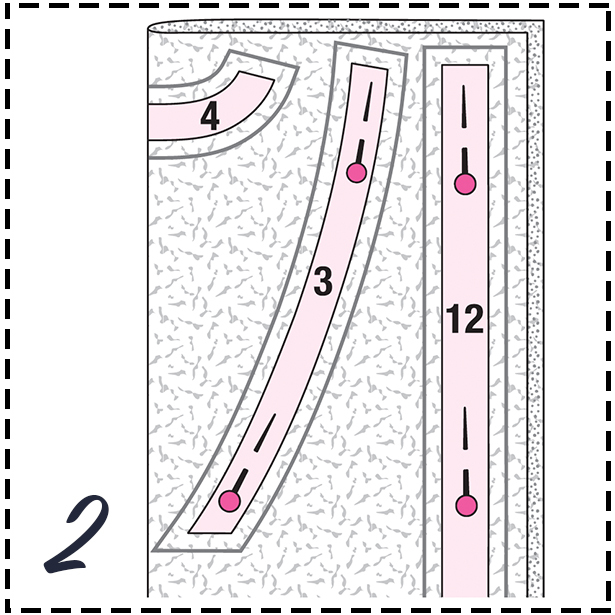 Check out all the great diagrams to help you sew this feminine blouse. Refer to the pattern’s store page for specific fabric yardage and notion requirements. 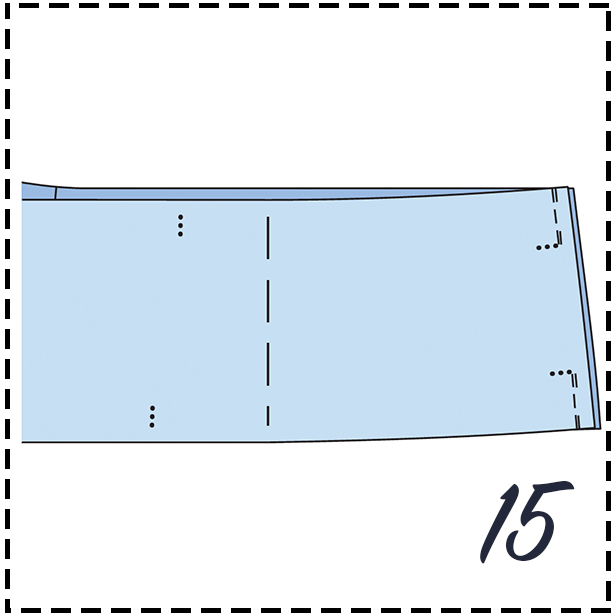 Also remember to add seam allowance (you can either add to the paper pattern before cutting or to the fabric around the pattern… see below), further info and amounts can be found in the instructions PDF after purchase. Fold the fabric in half lengthwise, right side facing in. 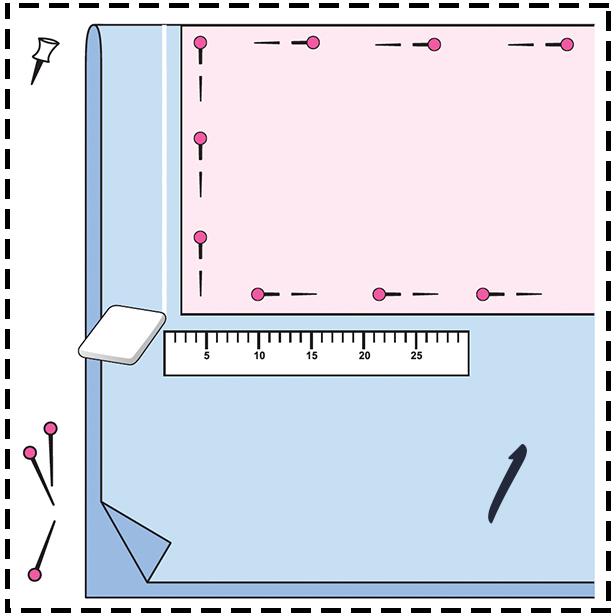 Pin the paper pattern pieces to the fabric as shown in the cutting layout. Place pieces 2, 4 and 11 at the fabric fold. 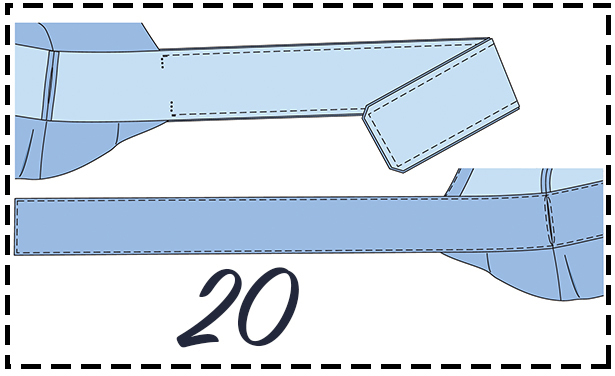 Fold piece 12 in half and also place at the fold. 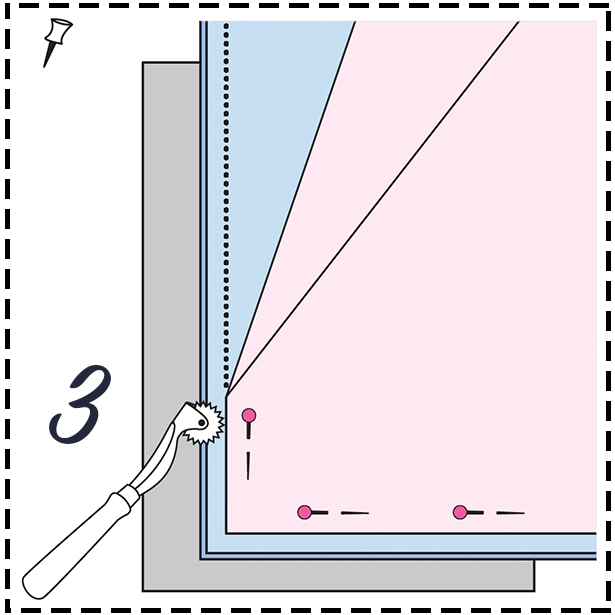 Use tailor’s chalk to mark 1.5 cm (5/8") seam allowances round all edges of the pattern pieces. Cut out the fabric pieces.. Fold the interfacing in half, adhesive side facing in. Fold piece 12 in half on the fold line. Pin on pieces 3, 4 and 12, with piece 4 at the fold. Add 1.5 cm (5/8") seam allowance at edges.. Cut out the pieces. Iron interfacing on wrong side of fabric, on cuffs to fold line. Fold back facing in half, right side in. Lay front facings and cuffs right sides together. Pin on the paper pattern pieces again. 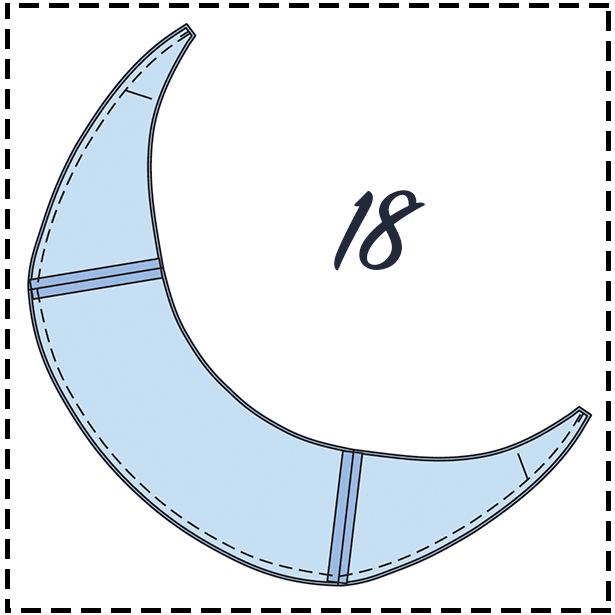 Use dressmaker’s carbon paper and a tracing wheel to transfer the pattern outlines (seam and hem lines), all other markings and * to the wrong side of the pieces. Follow the instructions included with the carbon paper. 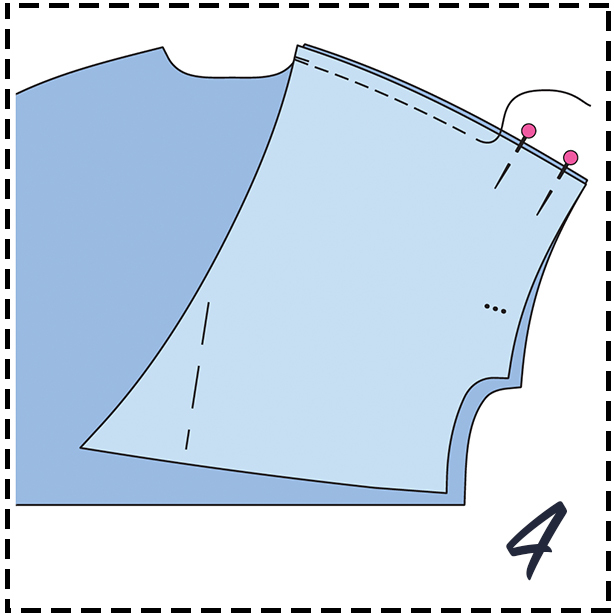 Use basting thread to transfer centre front on front pieces, front bands and peplum peplum to the right fabric side. Lay front pieces right sides together with back. Pin shoulder seams (seam number 1) and stitch. Trim allowances to 7 mm (1/4"), neaten together and press onto back. Pin front facings right sides together with shoulder edges of back facing. Stitch edges together (seam number 2). Press allowances open. 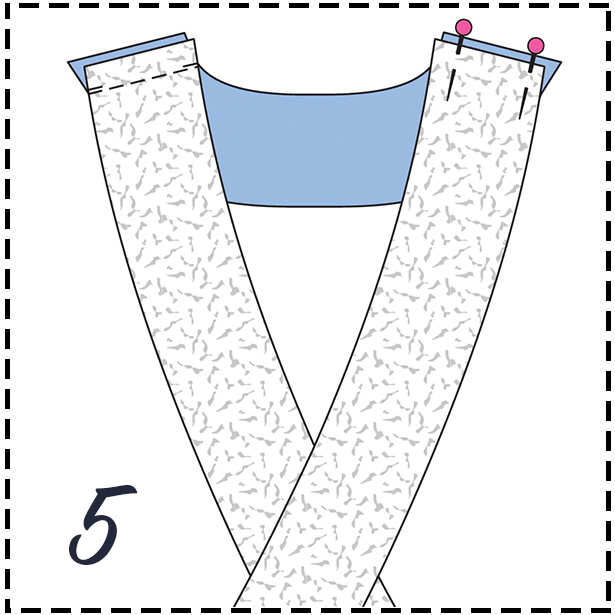 Neaten outer facing edge with zigzag or overlock stitching. Pin facing right sides together with front edges and neckline, matching shoulder seams. Stitch facing. Trim allowances, clip curves. Press allowances onto facing and stitch close to joining seam. Turn facing to inside. Baste edge, press. Hold inside facing edge at seam allowances of shoulder seams with a few stitches by hand. 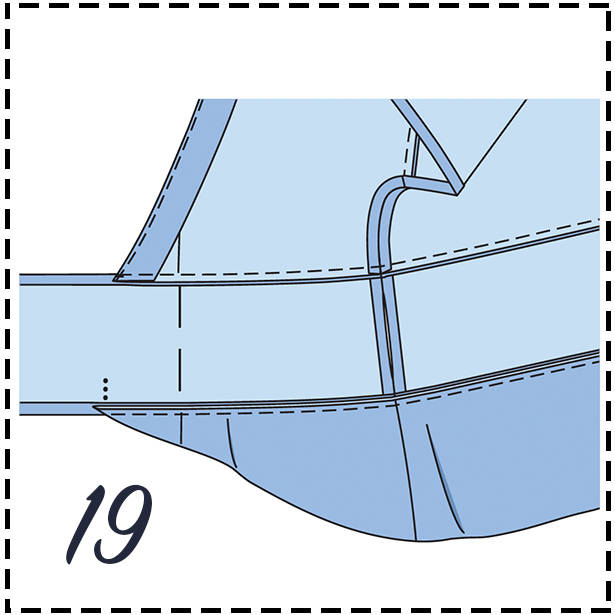 Clip allowance at lower sleeve edge at markings close to seam line. Press allowance between clippings to inside, turn in, pin and stitch close to edge. Pin sleeve right sides together with armhole edge, matching markings 3. 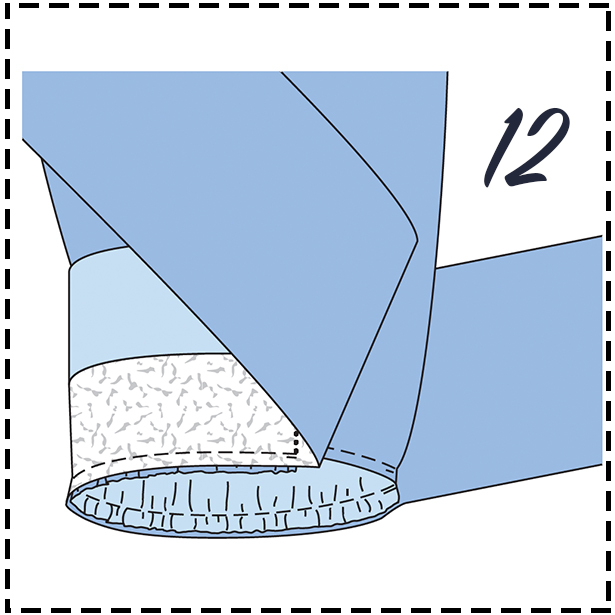 Match marking at top centre of sleeve with shoulder seam. Stitch. Backstitch to secure ends of stitching. Neaten allowances together and press toward sleeves. Lay front pieces right sides together with back. Fold sleeves lengthwise. Pin sleeve seams and side seams, pinning end of sleeve inset seams together. Stitch seams. Trim allowances, neaten together and press to one side. 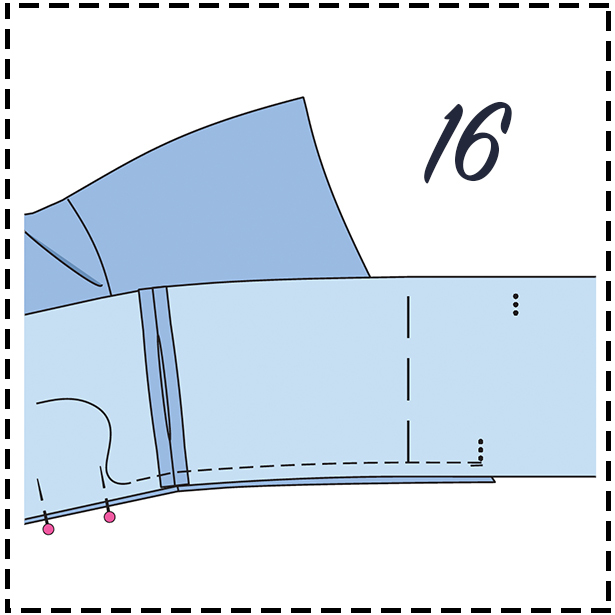 To gather lower sleeve edge, machine baste (longest stitch setting) 5 mm (3/16") to each side of marked seam line from * to *. 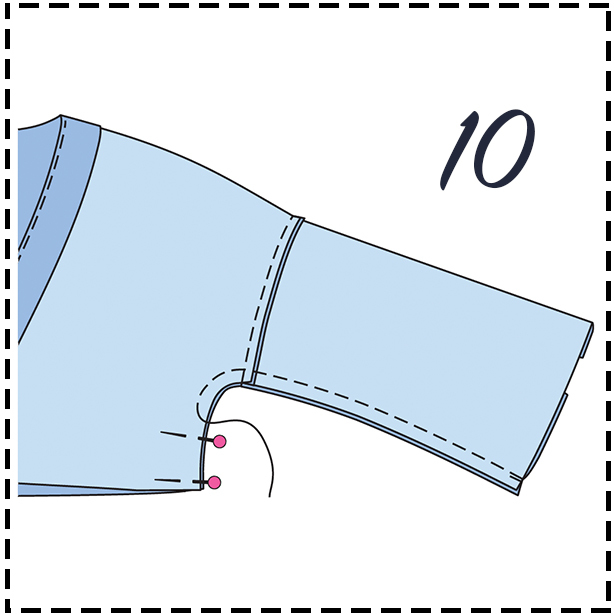 Hold bobbin threads and slip the fabric together to length of cuffs between markings. Knot threads. Distribute gathers evenly. 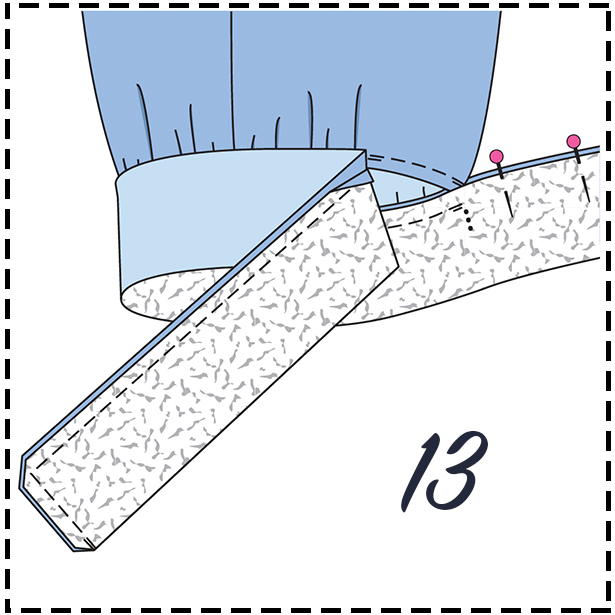 Pin interfaced half of cuff right sides together with lower sleeve edge between markings (ends of vent) and stitch (seam number 8). Backstitch to secure ends of stitching. 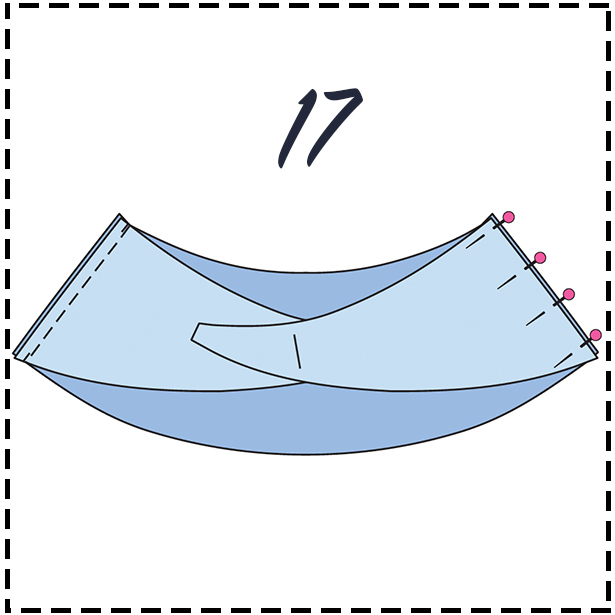 Fold cuff on fold line, right side facing in. Pin edges of integral bands each together to marking and stitch. Backstitch to secure ends of stitching. Trim allowances, trim corners at an angle. Turn bands and cuff. Baste edges, press. 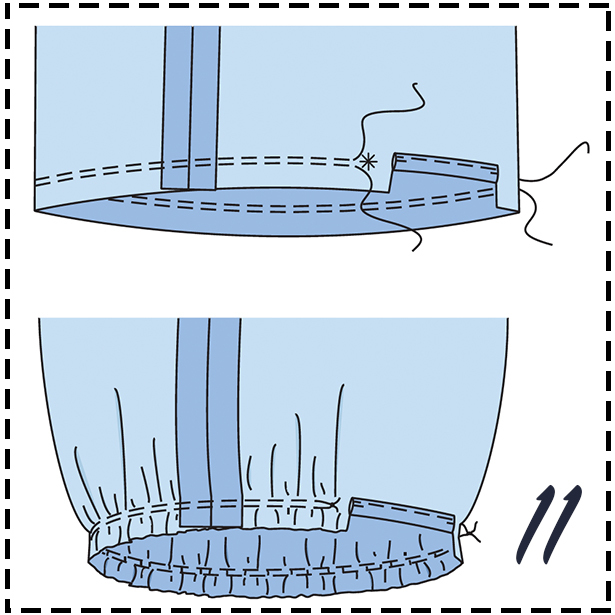 Turn in allowance at inside edge of cuff and pin at cuff joining seam. Stitch turned in edge along joining seam or sew by hand. The band is doubled. Outside band: Lay one right and one left band on a back band piece. Pin side seams (seam number 5). Stitch left side seam. Stitch right side seam from upper edges down and from lower edges up each to slit mark. Backstitch to secure ends of stitching. Press allowances open. 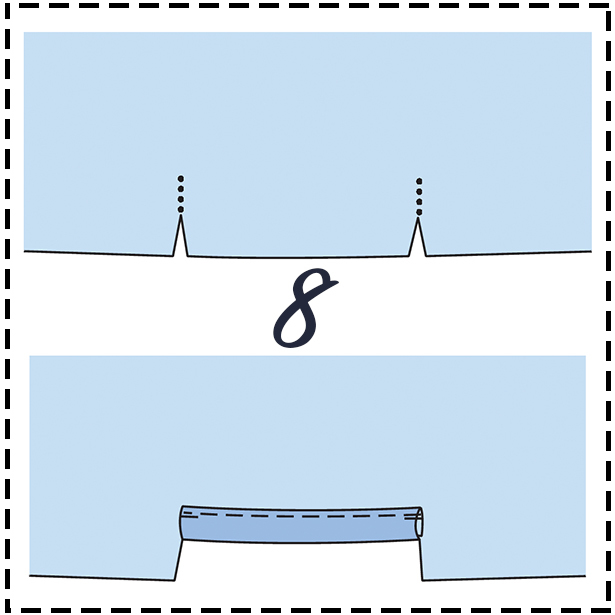 Inside band: Stitch side seams as on outside band, but leave slit open just the opposite. Pin band right sides together with lower edge of front and back pieces, matching centers and side seams. 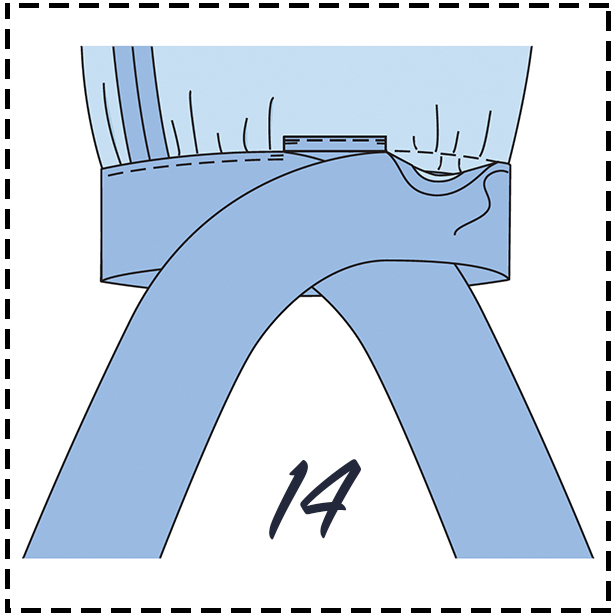 Place slit at right side seam. Match markings with front edges, integral bands overhand. Stitch band. Press allowances onto band. Lay two front peplum pieces right sides together with a back peplum piece each. Pin side seams and stitch (seam number 6). Press allowances open. Pin peplum pieces right sides facing. Stitch edges together as illustrated. Trim allowances to 5 mm (3/16"). Turn peplum. Press edges. Pin open edges together. 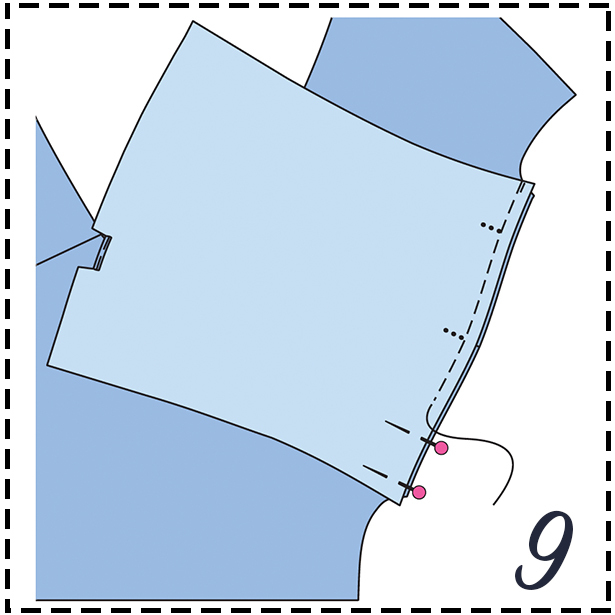 Pin peplum right sides together with lower edge of outer band between markings (seam number 7), matching side seams. Stitch. Press allowances onto band. Pin inside band right sides together with outside band, matching side seams and slits. Pin edges of overhanging bands together, laying allowances at joining seams out ﬂ at again. Stitch bands together each to front edge of front and peplum. Trim allowances, trim corners at an angle. Turn band. Press edges. Turn in inside band, pin and stitch close to joining seams. Go on to topstitch bands all in one. 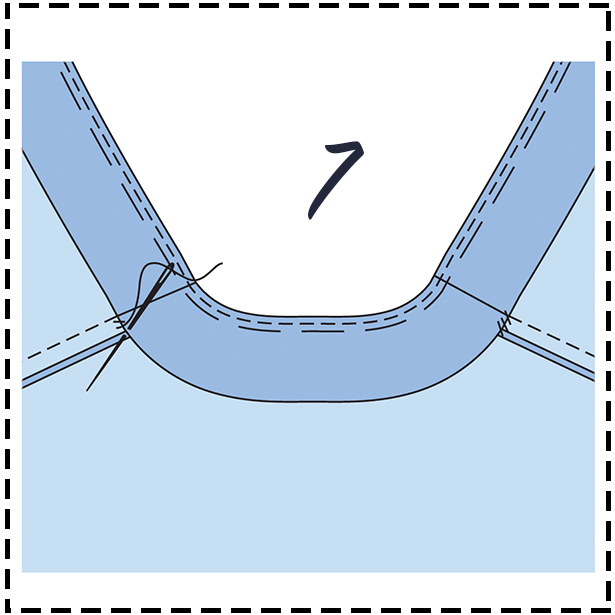 Pin slit edges of right side seam together, stitch close to edges. Want more sewing lessons? Check out our last one here on our Ruffled Sleeve Coat.